February 13-18, 2016 marked India’s inaugural ‘Make In India’ week held in Mumbai. Following Prime Minister Modi’s launch of the Make In India campaign in September 2014, the Indian government has consistently pursued its vision to invigorate the country’s manufacturing sector, which accounted for only 17 percent of India’s gross domestic product in 2015. Each year, 12 million young Indian citizens enter the workforce. Most of them however, are low-skilled workers, which the Indian job market does not have the capacity to fill. With these demographic challenges in mind, Modi’s government instituted Make In India in an attempt to shift focus to the manufacturing sector and create jobs for low-skilled workers. The Make In India week showcases the government’s acknowledgement that major contributions from foreign investors are critical to the success of the endeavor. Department of Industrial Policy and Promotion (DIPP) Secretary Amitabh Kant noted that “the main aim of the event is to attract more Foreign Direct Investment (FDI) into the country.” Indeed, 17 Indian states and 60 countries were in attendance. Make In India represents important opportunities for foreign investors. There are 25 target sectors in which to invest, including chemicals, media, construction, food processing, pharmaceuticals, energy, tourism, and wellness. 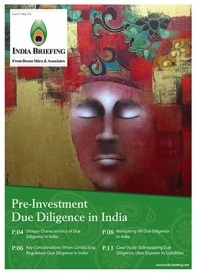 Recent policy changes have also made it easier to invest directly in Indian companies. FDI (which is defined as investment by a non-resident entity or a person in the capital of an Indian company) is perhaps the easiest way to take advantage of the Make In India campaign. Individuals and companies can also invest by incorporating a company in India, forming a sole proprietorship, or establishing a branch office within the country. If choosing the FDI route, companies and individuals can invest through the purchase of equity shares, convertible debentures, or through investments in limited liability partnerships. But each of these investment vehicles has limitations and requirements, such as pre-approval by the central Reserve Bank of India (RBI). Hoping to attract more investment, the government has eased FDI requirements in 26 sectors. India offers two routes for FDI: the automatic route – which does not require pre-approval by the government – and the government approval route. By allowing more investment under the automatic route, the government has made it easier to invest through FDI. However, even in sectors where FDI is allowed through the automatic route, if FDI exceeds certain limits, automatic approval can convert to the government approval route or companies can be required to meet other thresholds, such as sourcing a significant percentage of their raw materials from Indian-based small and medium sized businesses. In fact, most sectors have additional strings attached beyond the automatic route arrangement. Further, the automatic route may not be available under some investment vehicles. For more information on India’s Foreign Direct Investment guidelines, see Consolidated FDI Policy Circular of 2017. Significantly, India has also raised FDI caps in more than a dozen sectors including defense, banking, insurance, medical, pensions, and construction. While there are still sectors in which foreign direct investment is not allowed at all, an increase in the FDI caps has opened several sectors that were closed previously. Although caps still exist in many sectors, they have been raised by 25 to 50 percent in most cases, making FDI both possible and more attractive. The Indian government’s Make In India program has certainly opened up the country’s long stagnating domestic manufacturing sector to foreign investment. While more improvements are gradually being made, these changes represent important opportunities for foreign investors willing to put in the time and attention necessary into finding the right sector and the right investment vehicle in India.